The redband trailer for Matthias Hoene's Cockneys vs Zombies suggested a zombie comedy the likes of which we haven't been seen since we were first introduced to Shaun and his ragtag group of zombie apocalypse survivors. Now, Hoene's movie isn't anywhere near the ballpark of Edgar Wright's but it's not without its own share of laughs though some are of questionable taste (drop kicking a baby shouldn't be funny but damned it, I laughed) and the majority of others come at the hands of the oldies who have locked themselves up in their retirement home. The story unfolds with an Olympic backdrop. A construction crew doing some digging for one of the projects stumbles on an underground tomb which they open, accidentally unleashing a zombie outbreak in London's East Side. As the zombies multiply, two brothers, their cousin and a group of lowrent con artists are in the process of robbing a bank for a good cause: to save their grandfather and the retirement home he lives in from being demolished to make room for posh new housing. Quite clearly there are a couple of jabs at the politics of the Olympics here but the movie quickly loses sight of anything remotely intelligent, replacing smarts with a group of retirees spewing bad language and wielding guns. The bank robbing brothers don't simply leave the area once they realize something weird is going on. They set off in search of grandpa and eventually find him and his buddies hiding out in the retirement home kitchen. Now the hard part: rescuing the oldies and getting our of town without being turned into slow-moving zombies. The entire thing turns out to be easier than anyone anticipated when the old cronies embrace the guns and the team of old, young and dumb (a few of these characters are just plain stupid) shoot their way out of the retirement home and into a double decker bus and out of London, complete with high octave swearing and a few near misses. For the most part, Cockneys vs Zombies is a typical zombie movie and though the script from James Moran and Lucas Roche tries to be something more, it doesn't really succeed. There are a few laughs but they're mostly few and far between and the writers and director don't take full advantage of the real highlight of their movie: the retirees. Yes, old people swearing up a storm is pretty funny, as are a group of geriatrics with guns shooting at shambling zombies. The story should have focused on these guys rather than the bank robbers and the uneven story always picks up when focus shifts to the retirement home. It's quite a waste but Alan Ford and his retiree buddies relish their scenes and it shows. The bank robbery story isn't awful but it feels out of place with the zombie tale, almost as if the writers couldn't figure out how to expand either idea into a full length movie so decided instead to marry the two (with mixed results). 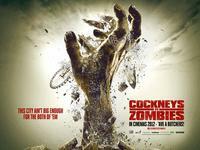 It's doubtful Cockneys vs Zombies will get much attention outside genre fan circles, it's not endearing or comedic enough for cross over appeal, but fans of the zombie movie aren't likely to be disappointed by the excellent practical effects and zombie designs and though the laughs are decidedly low brow, a handful of them do hit the mark.